Kozy Konversations: Babies wearing Babies . . . Finally, we have Kid Kozys!! Babies wearing Babies . . . Finally, we have Kid Kozys!! This is Piper (8) and Ever (3) carrying their dolls in their Kiddy Kozys! (Ever's doll of choice is his baby, Piper has her LPS penguin) I made my first Kiddy Kozy for Piper LONG ago, I have made some for friends and for gifts since then but that is as far as I have gotten with them. What better way to teach our kids natural ways to nurture babies . . . how to meet their needs and keep them close, than to example babywearing!! Kids have this desire to copy us and nurture their baby dolls in a similar way (and I know many of us have experienced seeing our kids nursing their baby dolls.) This is why there has always been a need for kid sized baby carriers. 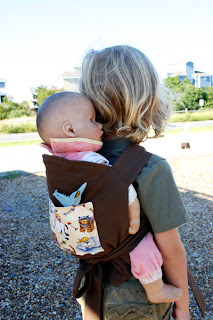 Yes you can use anything to make a baby carrier for your child to carry his babies, but it is also fun for them to have something that looks like ours! In coming up with the design for the Kiddy Kozy were trying to keep them as close to the adult Kozys as possible. Most aspects are the same, only downsized for little ones. There is no padding (not needed) so it is really lightweight. 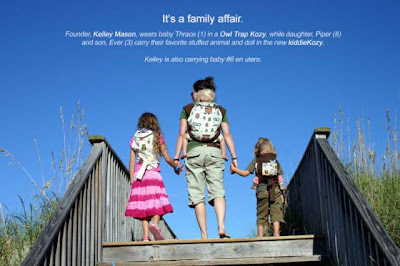 It has a body pocket so they can carry extra toys if wanted (or toy diapers) and it has a cute little strap pocket and ties right on, just like Mom (or Dad's) Kozy. In order to simplify things and keep costs down we make them solid bodied and you choose the fabric for the body pocket. But if your little one wants a Kozy matching yours we can custom make it for you for an added charge. Of course they are NOT reinforced to hold any weight so remember it is ONLY for dolls! 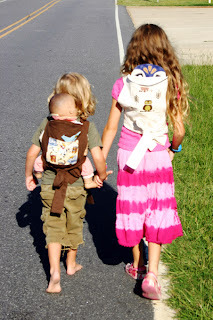 That is always the first things the kids ask, they want to carry their baby brother in their Kozy, LOL!! I tell them that they can wear him in a regular Kozy (I can fold it to fit them) but that this Kozy is specially made just for their baby dolls and favorite toys (notice Ever has an airplane in the pocket of his). For more info and to see fabrics and order just go to the Kiddy Kozy page at the Kozy Website.